This is my first post in quite a while! I wanted to share a little tool I put together to address a problem I’m sure many of us have faced. My Gmail account was nearing its quota, so I wanted to download all the photos and movies attached to the older emails before I went and deleted all the older stuff to make space. There is no way to do this natively in Gmail, and the only other solutions I could find for bulk saving Gmail attachments were browser add-ons and Office macros that I didn’t feel comfortable running against my Google account. 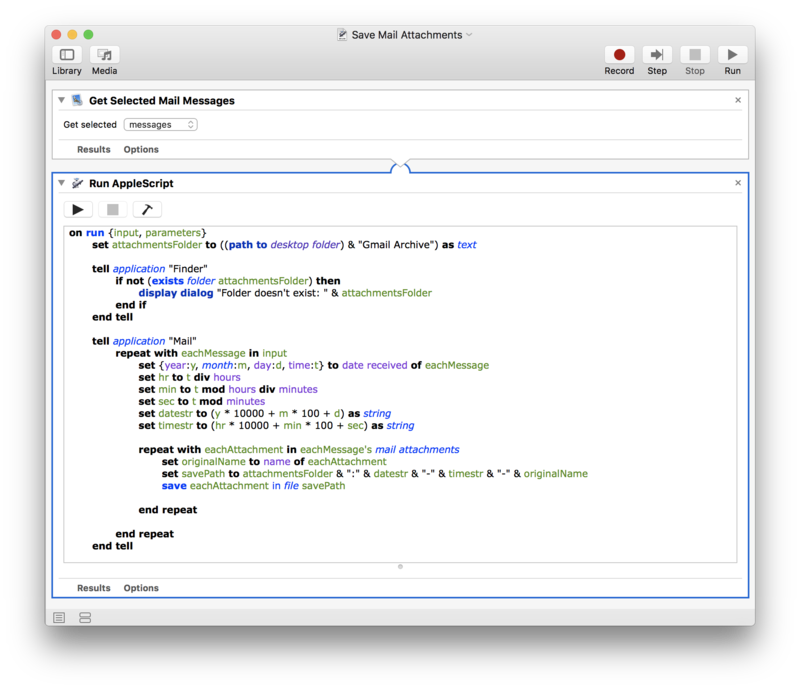 So, I developed a workflow using Mail.app, Automator, and a bit of AppleScript (see below). Yes, this is a heavily Mac-centric solution, but you use the tools that are available to you, right? Drag the “Get Selected Mail Items” action from the Library over to the workflow area. Make sure “messages” is selected in the drop down menu next to “Get selected”. Note: this code assumes you have a writable folder called ~/Desktop/Gmail Attachments. You can change that path if you so desire. In Mail.app, highlight the messages you want to extract the attachments from. You can, for example, search for messages older than a particular date, or those that have JPEG attachments, etc. Back in Automator, click “Run” in the top right corner or hit Cmd+R. This will start the workflow which will go through each attachment from each highlighted message, and save it with a time-stamped filename based on the date and time the message was received. Hopefully this is helpful. Leave me a comment if you have any feedback. This entry was posted in Programming on February 16, 2018 by bsterne.